"I have done my job. Cassani has the right to make his own choice, what he decides is right. Cassani probably had a different plan for the Worlds and you have to respect his choices. I wish my teammates all the best in Ponferrada." Filippo Pozzato ended a very strong and consistent showing at the Trittico Lombardo race series by taking third in Tre Valli Varesine. Nonetheless, the Italian was excluded from the Italian roster for the Worlds. 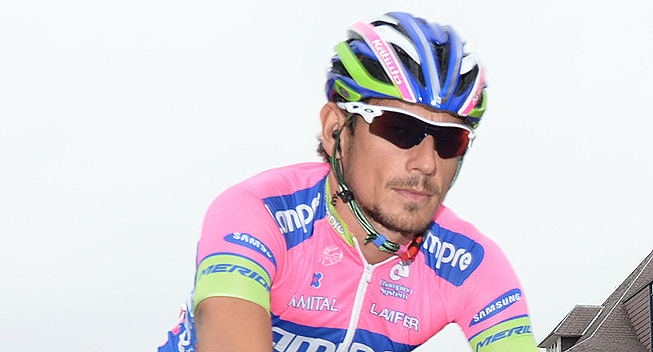 Filippo Pozzato went into the Trittico Lombardo race series with the aim of earning selection for the World Championships. He got it all off to a great start when he finished second in the Coppa Bernocchi but chose to skip the Coppa Agostoni where he was the defending champion, to focus all his energies on today's Tre Valli Varesine. With a harder course, the Italian wanted to prove to Italian national coach Davide Cassani that he could handle the strains of the hilly circuit in Ponferrada. Pozzato never seemed to be in trouble on the many climbs and made it into the 8-rider front group that sprinted for the win. In the end, he had to settle for third but completed a very consistent showing in the three races. "I'm satisfied with the performance of the team," sports director Daniele Righi said. "The race was made selective by the rain but our riders moved in a perfect way and we succeeded in having the two best riders in the key action that characterized the final kilometers. Durasek was great in supporting Filippo in view of the sprint, but Albasini was the strongest. "The balance of the Trittico Lombardo was strengthened by this third place as it comes after Niccolo Bonifazio's win in the Coppa Agostoni and Filippo's second place in the Coppa Bernocchi." Nonetheless, it was not enough for Pozzato who was not included on the Italian roster for the Worlds. "I raced to do well but if he thinks that the course is not suited to me, it is right that I stay at home," he said. "I have done my job. Cassani has the right to make his own choice, what he decides is right. Cassani probably had a different plan for the Worlds and you have to respect his choices. I wish my teammates all the best in Ponferrada."